222 pages | 15 B/W Illus. The concept of ’natural heritage’ has become increasingly significant with the threat of dwindling resources, environmental degradation and climatic change. As humanity’s impact on the condition of life on earth has become more prominent, a discernible shift in the relationship between western society and the environment has taken place. This is reflective of wider historical processes which reveal a constantly changing association between humanity’s definition and perception of what ’nature’ constitutes or what can be defined as ’natural’. From the ornate collections of specimens which formed the basis of a distinct concept of ’nature’ emerging during the Enlightenment, this definition and the wider relationship between humanity and natural history have reflected issues of identity, place and politics in the modern era. 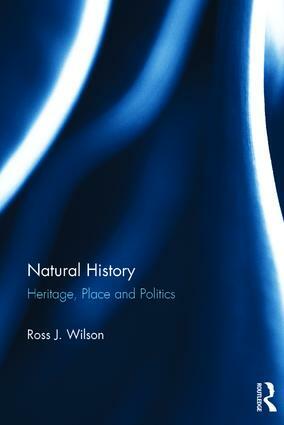 This book examines this process and focuses on the ideas, values and agendas that have defined the representation and reception of the history of the natural world, including geology and palaeontology, within contemporary society, addressing how the heritage of natural history, whether through museums, parks, tourist sites or popular culture is used to shape social, political, cultural and moral identities. It will be of interest to scholars and practitioners within heritage studies, public history, ecology, environmental studies and geography. Ross J. Wilson is a Senior Lecturer in the Department of History and Politics, University of Chichester, UK. His research takes approaches from archaeology, anthropology, literature and sociology to examine aspects of modern history and its representation in the present. His current research examines the history and heritage of health and safety in Britain and the United States, the representation of the First World War in British culture, the history of New York, digital heritage, memory studies and the role of museums and heritage sites as a mode of social and political reform.